Welcome to the 2nd part of this 5-part series where we’ll cover best-practices and practical tips & tricks for developing, deploying, and managing a web application with an eye for application performance and operational efficiency using AWS CloudFormation and Elastic Beanstalk. Last week (blog post and Office Hours video) we introduced the aMediaManager application, all of its components, and then used CloudFormation and Elastic Beanstalk to deploy it into an EC2 Classic environment. We’ll be discussing this blog post – including your Q&A – during a live Office Hours Hangout at 9a Pacific on Thursday, April 17, 2014. Sign up at http://bit.ly/1hDcKaU. The complete application source code and CloudFormation templates are Apache licensed and available on GitHub at http://github.com/awslabs/amediamanager. 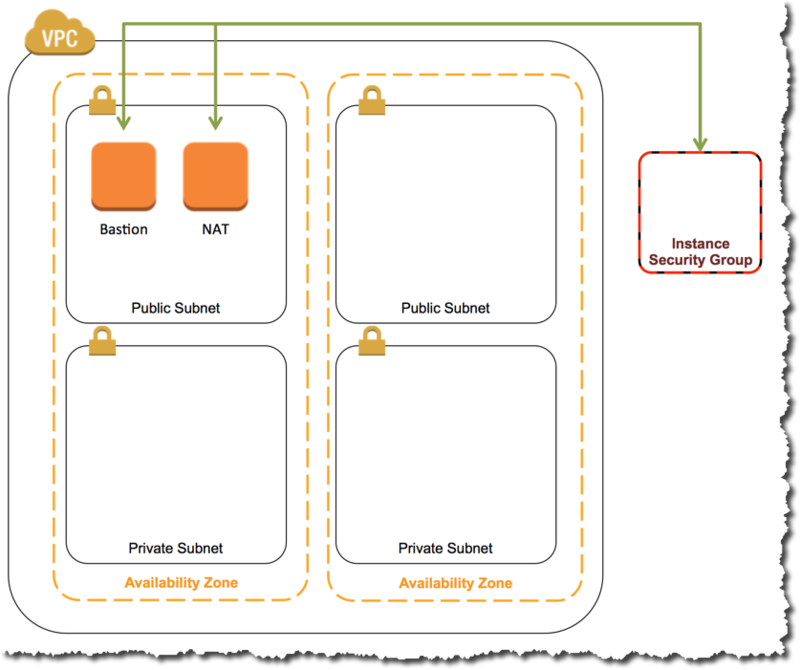 All defaults in the CloudFormation template fall within the AWS Free Usage Tier. If your account is not eligible for the free usage tier, or if you use non-default values, you will be charged for the resources provisioned by this template. To delete the application, navigate to the AWS CloudFormation Managemenet Console, choose the amediamanager stack and click the Delete Stack button. If you’d like to follow along with a running version of the application, you can deploy it now using CloudFormation by clicking this link. Edit cfn/vpc/launch-params.json, replacing YOUR_EC2_KEY_PAIR with the name of a real EC2 Key Pair in your account. Also in cfn/vpc/launch-params.json, modify VPCAvailabilityZone1 and VPCAvailabilityZone2 depending on the region you’re deploying to. amm-master.cfn.json: This is the parent template and it only defines three Resources: the embedded CloudFormation stacks amm-vpc.cfn.json, amm-elasticbeanstalk.cfn.json, and amm-resources.cfn.json. To run the entire application, run this stack. amm-vpc.cfn.json: This template defines the VPC network topology, including an EC2 Instance for both Bastion and NAT services. The template also defines a Security Group. More on that in a bit. This stack outputs the ID of the VPC, Subnets, and Security Group it creates. amm-resources.cfn.json: This template defines all of the dependencies for our application, including RDS databse, ElastiCache cluster, DynamoDB table, S3 bucket, IAM roles, etc. This stack takes as input parameters the VPC and Subnet IDs required to launch RDS and ElastiCache clusters into the VPC. 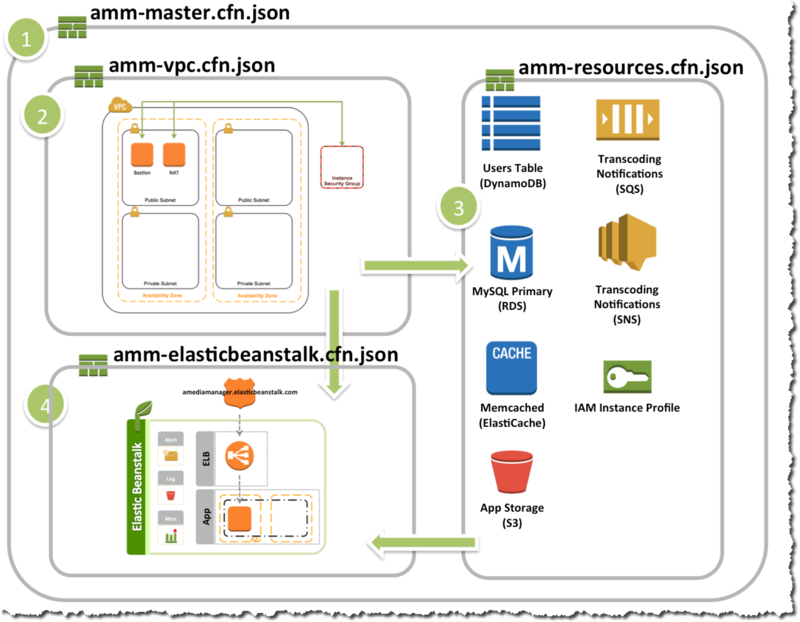 amm-elasticbeanstalk.cfn.json: This template defines the Elastic Beanstalk Application and Environment that runs our app code. It takes as inputs the IDs of its resource dependencies (DB hostname, S3 bucket name, etc), as well as the VPC ID, Subnets, and Security Group ID created by the VPC stack. This approach has a downside. Fn::GetAZs returns every Availability Zone for your account, but it is possible that – for accounts that existed before VPC was introduced – an Availability Zone may exist but is not VPC enabled. In my case (where my account is ~5 years old), I have 5 Availability Zones but 1 of them isn’t available for VPC. We covered more examples of building VPCs with CloudFormation a few months ago in this post: https://github.com/evandbrown/aws-hangouts/tree/master/20140213_cfn. In addition to code samples, the post includes a video discussion with Q&A. Hopefully you find it helpful! When amm-master.cfn.json creates the amm-elasticbeanstalk.cfn.json stack, it has already created the VPC and Resources stack and has access to their outputs. 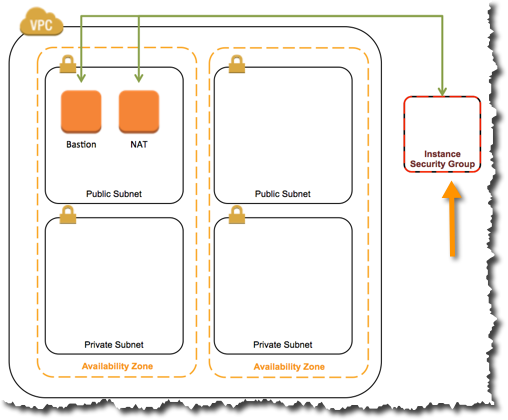 Notably, the VPC stack outputs the IDs of both of the public and private subnets it created. What is the VPC the application will run in? What are the (public) subnets the ELB should be deployed to? What are the (private) subnets the EC2 Instances should be deployed to? Now let’s explore how to use Mappings and S3 bucket-naming schemes to build templates we can easily run in different AWS Regions. Parameterizing AZs as described earlier is a good solution for a sample app like this that is being shared broadly and publicly: I don’t know the details of each of your accounts and which AZ may not be VPC enabled, leaving that to parameters makes the template maximally flexible. But let’s imagine we’re really building this aMediaManager application on a team. We’d likely be sharing an AWS Account and know the Availability Zones we want to use in each Region. In that case, defining a Mapping of Region->[AvailabilityZone1, AvailabilityZone2] in the template would allow us to enforce some consistency and not require params. We talked in detail about other uses for Mappings – especially as they relate to VPC and multi-region templates – in this post a few months ago. Extra Credit If you’re looking to sharpen your CloudFormation skills, modify the amm-vpc.cfn.json template to use Mappings as described, rather than Parameters. Even though we can upload and run the amm-master.cfn.json file from our local machine to kick off our stack, remember that template defines other nested CloudFormation stacks, and you have to provide a TemplateURL for each stack. You can see right away that we didn’t hard-code the TemplateURL value (e.g., https://my-bucket.s3.amazonaws.com/path/to/template/file.cfn.json). Rather we used the Fn::Join intrinsic function, several parameters, and AWS::Region to construct the URL by convention. First, don’t forget to join us for the live Office Hours Hangout later this week (or view the recording if it’s past April 17 2014 and you don’t have a time machine). In Part 3 of this series (blog post and Office Hours links forthcoming at http://blogs.aws.amazon.com/application-management) we’ll dive into best practices for writing application code that will run easily in any AWS Region, and discuss how (and why) we used Elastic Beanstalk and S3 to store and manage our application’s configuration.